For the first couple of weeks, Laura Harrison thought it would get fixed. “Elevators go out. It’s a normal thing,” she would say to herself and her colleagues working out of the College Eight academic building. As days turned to months, Harrison saw no signs on the elevator that had been out of service since the campuswide power outage on Jan. 30. She saw people in wheelchairs coming up to the elevator and waiting 20 minutes thinking it would come, and nothing would happen. The elevator in the three-floor College Eight academic building has been out of operation for 83 days. Photo by Alex Posis. Harrison filed a formal Americans with Disabilities Act (ADA) grievance in early March, and recently amended the five-page letter with more updated information from her informal meetings with a handful of staff members. She felt “shuffled around via email” when she started an informal grievance process. 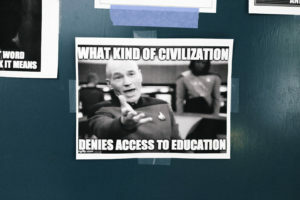 Scott Hernandez-Jason, UCSC’s news and media relations director, said UCSC received six formal ADA grievances from students and staff since July 1. On a campus that by its nature is difficult to navigate, people who have mobility impairments face extra difficulties when crucial means of transportation like elevators, go out, whether for planned maintenance or unexpectedly. After the formal grievance was filed, Harrison attended a meeting with Associate Chancellor and ADA Compliance Officer Ashish Sahni, who unexpectedly brought along two representatives from Otis Elevator company to explain costs associated with repairing or replacing the elevator. Harrison said when the representatives began to quote prices during the meeting, Sahni began to explain that if a new elevator was built, people might lose TAships in the future to divert costs. When recounting the moment, the sarcasm in Harrison’s tone was sharp. 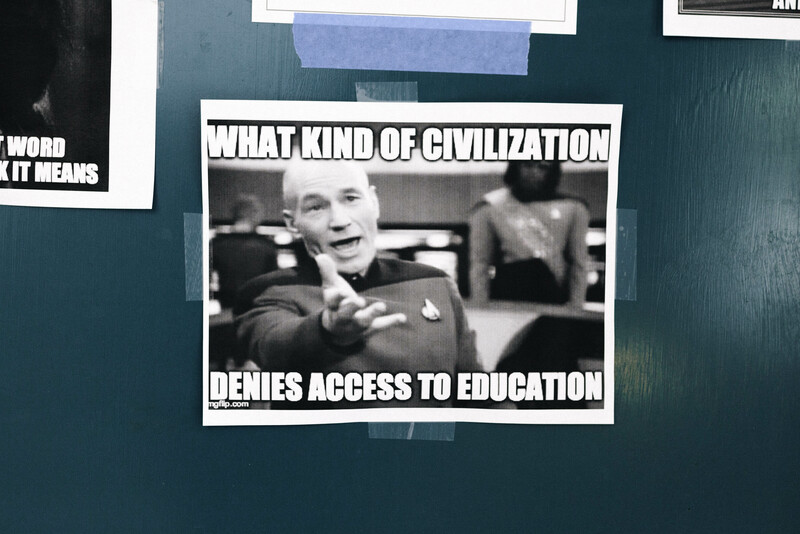 Memes were posted on the elevator doors around the “out of order” sign. Photo by Alex Posis. The remedies Harrison outlines in the letter includes the repair of the College Eight elevator and a “real conversation about the structural inequality of this campus that already exists and no one’s talking about, or that people are really afraid to bring up.” Harrison said this dialogue needs to be university-organized and between staff and students. Part of the addendum to Harrison’s original grievance will include petitions she is circulating, and letters from custodial staff or non-UCSC staff, like workers who make various deliveries to the College Eight academic building. The university has 15 days to respond to the formal grievance, which was sent last week to Sarah Latham, the vice chancellor of business and administrative services. Part of Harrison’s delay in filing the formal petition was because she and Assistant Dean of Students Lucy Rojas couldn’t figure out who to file the grievance against. Harrison said there were many complications to get accurate information about who has jurisdiction over various elevators on campus. The Jan. 30 power outage burnt out key components of the College Eight elevator controller, and during Physical Plant’s troubleshooting process, it discovered more damaged parts. Henry Salameh, director of Physical Plant, said this repair process has been complicated because the company that built the elevator in 1990 went out of business in the late ‘90s and there are no “on the shelf” parts currently available. 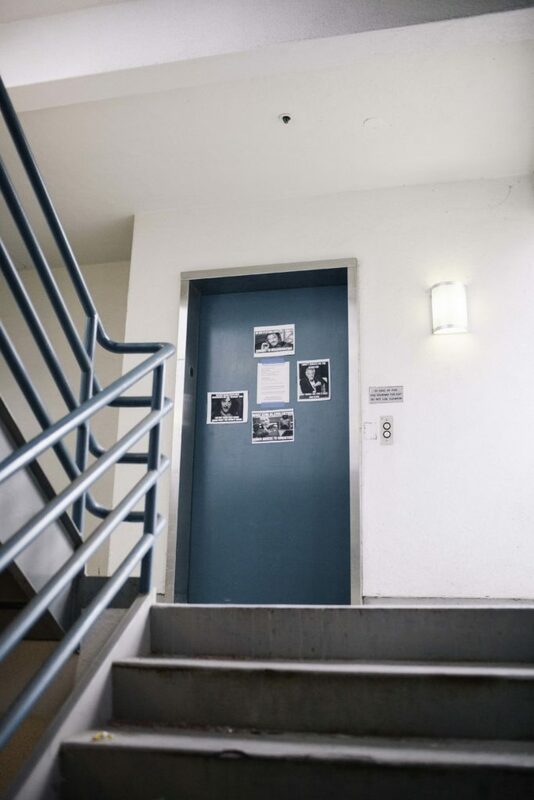 Hernandez-Jason, UCSC’s news and media relations director, said the university’s goal is to minimize the impact of the broken elevator on people at College Eight, and get it running as soon as possible. ADA Facility Access Coordinator Susan Willats told Barbara Laurence this is her top priority to fix on campus. The elevator is said to be back in order on May 22, after further repairs are made from new parts. However, sociology professor Hiroshi Fukurai, who has worked out of his office on the third floor of the College Eight academic building since 1997, said for the last three to four years, the elevator has had various problems. He noted the loud noise the elevator makes when it was working, and Harrison, a Ph.D. student, said she brought up issues to Willats over a year ago. Salameh said Physical Plant looked back at the record of this elevator for the last five years and the repairs were “few and minor.” He added that UCSC has a full-service contract with Otis Elevator, which costs almost $170,000 annually and covers routine maintenance, but not obsolete components. A month ago, Harrison started an online petition — “Make UCSC Accessible” — citing four “inaccessible and segregated spaces managed by UCSC right now, including: Humanities I, Social Sciences II and the Delaware Building.” Salameh said those three elevators are now all back in service — the elevator in Humanities I was out for four weeks due to water that leaked into the elevator and damaged the controller, the elevator in Social Sciences II was closed for four weeks due to a faulty hydraulic valve and the elevator in the Delaware Building was out for six weeks during a scheduled repair. Rick Gubash, a learning disability specialist and service coordinator at the Disability Resource Center (DRC), said the DRC has no role in facility access because accessibility is a campuswide responsibility. The DRC informs students of their options for filing a grievance and informs them of their right to do so. Currently, 1,136 students use DRC services, and 52 of those students report having mobility-related disabilities. For anyone with mobility impairments there are various difficulties maneuvering through campus. To emphasize this point, professor Fukurai asked how heavy the door to the College Eight academic building was. Harrison, while grateful for her supportive advisers, often feels ostracized from the university because of its lack of care over issues affecting her life every day at UCSC.